Mission Specialist Steve Bowen works outside the International Space Station during the second STS-133 spacewalk. This story was updated at 5:55 p.m. ET. HOUSTON – Two Discovery shuttle astronauts floated outside the International Space Station on one last spacewalk today (March 2) to help prime the orbiting lab for the years ahead after NASA's shuttle fleet retires. Astronauts Steve Bowen and Alvin Drew tackled a laundry list of space maintenance tasks outside the space station, overcoming delays from a minor spacesuit leak and a helmet light malfunction in the process. The first glitch popped up before the spacewalk even began. Today's excursion was the second and last planned spacewalk during Discovery's STS-133 mission – the orbiter's final flight before being retired. Bowen and Drew successfully completed one prior spacewalk on Monday (Feb. 28). This is Discovery's final mission before being retired later this year. NASA only has two more shuttle flights planned, one each for the Endeavour and Atlantis orbiters, before shutting down the program. The remaining flights are delivering the vital spare parts NASA needs to the station going once the shuttle program ends. Once the spacewalkers got to work, the orbital day went fairly smoothly. Drew immediately began venting toxic ammonia from a failed cooling pump module that he and Bowen had moved to an external stowage platform on their previous spacewalk. One of Bowen's main duties was to remove an experiment panel from the outside of the station's Columbus laboratory. Bowen rode on the end of the station's robotic arm to retrieve the panel and attach it to the inside of the shuttle Discovery's payload bay. The panel will be returned to Earth at the end of Discovery's STS-133 mission. "Awesome job to the whole team. You made it look simple," said astronaut Tim Kopra, who supported the spacewalk from Mission Control here at NASA's Johnson Space Center. Kopra was set to be a mission specialist and lead spacewalker for the STS-133 mission, but was replaced by Bowen after being injured in a bicycle accident just over a month before launch. The spacewalkers completed various other tasks for the station's upkeep, including removing thermal coverings, attaching camera lens covers and adjusting loose radiator grapple beams that had been improperly installed during a previous shuttle mission. It was while the spacewalk passed the five-hour mark, when the second glitch occurred. The helmet-mounted lights on Drew's spacesuit came loose. Mission Control told Drew to stay put until Bowen made his float by to try and fix the light attachment, but it was hopeless. "That's not going to work," Bowen said. "I'm sorry, Al." Bowen re-entered the airlock and the astronauts switched the batteries of their suits off at 4:56 p.m. EST (2156 GMT), marking the end of the day's excursion. The total duration of today's spacewalk was six hours and 14 minutes. "Thank all you guys for the good, quick reaction, we really appreciate it," Mission Control radioed to the spacewalkers after Bowen was unable to reattach Drew's helmet lights. "You guys look great out there." The spacewalkers completed a few other tasks for the space station's upkeep, including removing thermal covers, attaching camera lens covers and adjusting loose radiator supports that weren't installed properly during a previous shuttle mission. 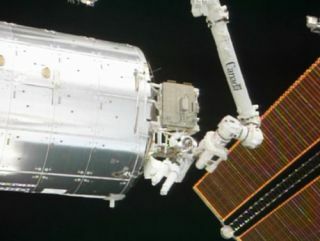 "You are the man," astronaut Nicole Stott, who was directing the spacewalkers from inside Discovery's mid-deck, radioed to Drew, after he was able to tighten the beams. "Houston agrees – Al is the man," Kopra replied from the ground. Bowen and Drew also took breaks from the work to take pictures of the Earth below, including the Caribbean islands and areas around their Florida launch site, where they blasted into space five days earlier. "We're all very proud of you guys here in Houston," Kopra said at the end of the spacewalk. Today's outing was Bowen's seventh spacewalk and Drew's second time venturing outside of the space station.